Hong Seol's life is filled with work and study, and her diligent attitude is often taken advantage of by others. Yoo Jung was similar in the past but has developed an exacting system of give-and-take to protect himself. Behind his solicitous smile lies a cold mind that demands payment for any mistakes it notes. When he wants to start dating Seol, she finds herself caught in a tangle of problems as the consequences of his past and present actions come to light. 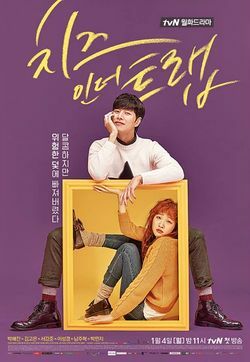 This drama is based on a Korean manhwa/webtoon Cheese in the Trap (치즈인더트랩) by Soonkki. The lead role was offered to actress and singer Suzy, but she refused. The lead role was offered to actress Kim Go Eun, but she also turned it down due to crossed agendas. However, Director Lee Yoon Jung insistently offered her the role, promising her flexible schedules, so the actress accepted the role. They had problems with the original author of Webtoon because she claimed that the final story deviated completely from the original story. There were also claims because the drama story did not correctly reflect Yoo Jung's main character. Due to a large number of complaints and criticisms, the production staff of the drama publicly apologized to the original Webtoon writer and fans on February 29, 2016. In a later communiqué tvN also apologized for the end of the drama, which was also heavily criticized. As a fan of the original webtoon, Park Hae Jin was disappointed that some of the scenes he recorded were not broadcast, so he feels he left a hole in the drama he said "There were scenes I filmed with Gong Joo Young (Kim Ki Bang). The story behind this is that Yoo Jung and Gong Joo Young were childhood friends and Gong Joo Young couldn't help holding a grudge against Yoo Jung because of it. We filmed, but we never went on the air," Park Hae Jin said, adding, "If we did, this would have helped to understand Yoo Jung's character better. There were other scenes we filmed and they were necessary for the plot, but they never went on the air. This page was last edited on 9 October 2018, at 18:28.